A national leader in both renewable energy development and retail sales to electricity consumers since 1999, Community Energy was founded to ignite the solar-and wind-innovations market and build the supply of fuel-free energy. The company started by selling wind power from Pennsylvania wind farms to institutions around the state. It now serves more than 115,000 residences and organizations throughout the Northeast and Midwest. “We leverage the demand from these voluntary customers to support our efforts to develop new wind and solar projects,” says Jay Carlis, Community Energy’s vice president of retail. Green credentials: As a pure renewable energy company that focuses almost exclusively on wind and sun, Community Energy offers the highest-quality, greenest products in each of its markets. For Pennsylvania electricity customers, it offers a 100-percent local wind and solar products. “Most electric suppliers in the PECO territory offer green products made from renewable energy certificates from wind farms halfway across the country,” Carlis says. 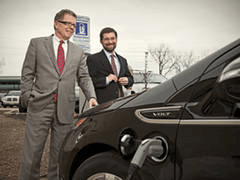 Green innovation: Community Energy just installed the Main Line’s first public electric-vehicle charging station in downtown Wayne, powered with Pennsylvania wind energy. “While the number of electric vehicles in the area remains small, the existence of public infrastructure will help ease the transition,” Carlis says. Bragging rights: Community Energy owns and operates a rooftop solar project at Eastern University above the Eagle Learning Center. Under a 20-year agreement, the university purchases all the power from the system at a fixed rate, protecting it from rising electricity costs. Eastern has been matching 100 percent of its electricity use with Wind Energy Certificates for nearly a decade. “We’ve always known the people who live on the Main Line to be forward-thinking when it comes to clean energy,” says Carlis. Green dream: For the country to be powered by 80 percent renewable energy—wind, solar, hydro, with energy storage—within 10 years or fewer. “The benefits would outweigh the costs,” Carlis says.